Of late, I have been trying to experience and understand the journey of kebabs in India. And I was quite fortunate to receive a call from Kebab Gali, a small restaurant located in Yusuf Sarai, to try out different varieties of kebabs. The name Kebab Gali raised my curiosity and expectations, as it resembles the name of a by-lane in Jama Masjid, Gali Kebabian. The restaurant is owned by Deepak, who also owns an electronic goods shop in Lajpat Rai Market. His passion for kebabs made him open Kebab Gali, 1st Floor, No.12, Yusuf Sarai Community Centre, next to Green Park Metro Station, Yusuf Sarai, New Delhi, Delhi-110049. You can contact him on 011-41629911. I started with galauti kebabs priced at Rs 195 , one of the softest kebabs that literally melt in the mouth. 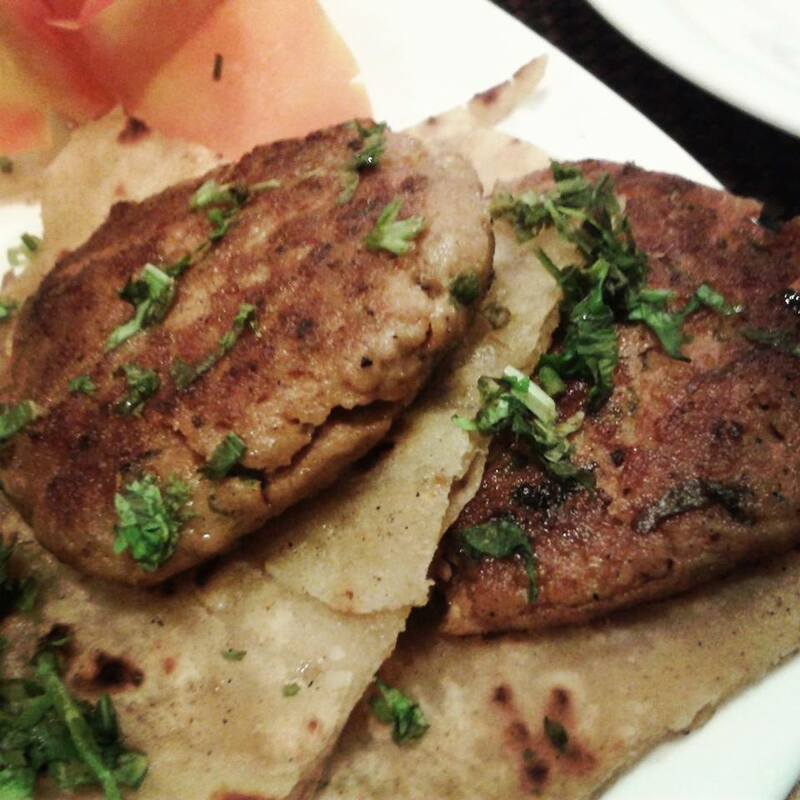 The galauti and the similarly priced kakori kebabs are served with warqi parantha. Other kebabs which I had at Kebab Gali were dohra kebab (Rs. 195), a combination of chicken and mutton seekh kebab, and kalmi kebab (Rs. 195) which were chicken drumsticks cooked in a tandoor, chicken gilafi kebab (Rs. 185), minced mutton kebabs in a crisp coating of capsicum, and lastly, tomato, onion and chicken malai kebab. The kebabs I liked the most were chicken malai, galauti, kakori and gilafi kebabs. Kebab Gali also offers Awadhi style dum biryanis – Awadhi chicken biryani, Awadhi mutton biryani, Awadhi anda dum biryani, and Awadhi vegetarian biryani. 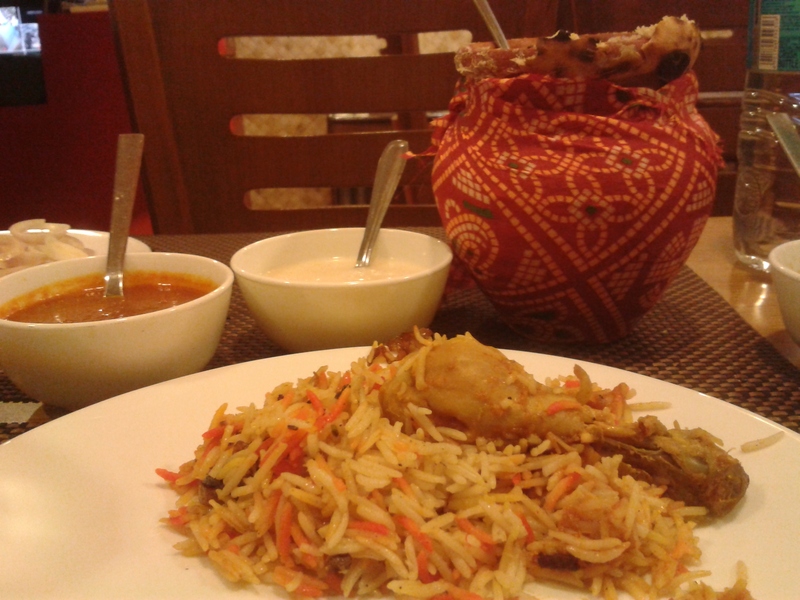 Biryani is served with salan and raita. Dum biryani is cooked with layers of marinated chicken and rice, sealed off in a utensil with dough, on low heat so that the aroma of spices and flavors remain intact. Kebab Gali offers “Biryani Party Packs” starting from 4 pieces at Rs. 385 to 110 pieces at Rs. 8800. Kebab Gali also has interesting curries to offer – chicken rara and mutton rara, dhaba meat curry, malabari chicken, mutton nahari and lal maas. I tried each one of them, but they failed to impress me. Although the name of the restaurant is Kebab Gali, I am surely going to visit again for the Awadhi chicken and mutton dum biryani.